John's letter - focusing on density & height, family-friendly housing, and the relationship between Charlesview and Harvard - is here. You can read their comments - focusing on density, height, parking, financing, open space, and retail - here. 139-143 Brighton Ave - Change the legal occupancy from offices, retail, beauty salon, food retail with #366A take-out to offices, retail, beauty salon, food retail with #36A take-out, four residential units and erect a two-story addition. The Globe recaps the March 12 Harvard Allston Task Force meeting and new commitments being made by the BRA about Charlesview, Harvard, and the future of our neighborhood. Q: Who is this "councilor" described in this story? Q: Think Harvard will cooperate? At-large City Councilor submitted this letter to the BRA on the subject of the Charlesview relocation and expansion project. In the letter he focuses on the issues of density and height, traffic and parking, and "family friendly" housing and affordability. Last summer, considerable attention was given the Massachusetts Open Meeting Law and its potential applicability to the BRA's Harvard and Boston College Task Forces (see coverage by the Globe, TAB, and Mike Pahre 1, 2, 3). At the time, the main issue was whether or not the Task Forces could meet with the BRA and/or universities without members of the general public in attendance. At the time, the Suffolk County District Attorney's Office said the Open Meeting Law did apply to these Task Forces and the public must be allowed to attend all meetings that do not fit the law's narrow definition of "executive sessions". The BRA disagreed, stating that the Open Meeting Law does not apply to these advisory groups. Regardless, the Harvard Task Force and, I believe, the BC Task Force have allowed the public to attend all of their meetings since. This issue of the Open Meeting Law has returned this week because, on two occasions, people have been forbidden from videotaping public meetings held by the BRA. On Monday, I was prevented from recording the BRA's Charlesview meeting. Last night a Boston University journalism student was prevented from recording the Harvard Allston Task Force meeting. The law is clear that "a meeting of a governmental body may be recorded by any person in attendance by means of a tape recorder or any other means of sonic reproduction or by means of videotape equipment". The disagreement between City Hall and the DA seems to be on what exactly defines a "governmental body". "The purpose of the Open Meeting Law is to eliminate much of the secrecy surrounding the deliberations and decisions on which public policy is based. It accomplishes this purpose by requiring open discussion of governmental action at public meetings." Similarly, the City's "A Citizen’s Guide to Development Review under Article 80 of the Boston Zoning Code" states that "Citizen participation is vital to the success of development review under Article 80." "Of special significance is the fact that the superintendent, because he is clearly not a "governmental body," could, by himself, have accomplished the task of screening and interviewing candidates in a closed session, entirely free from the requirements of the open meeting law...The selection committee does not fall under the statute because it is not a committee of the town of Hanover but a committee of the superintendent. " But decisions about development proposals are not decisions that can be made by any single person. These decisions are ultimately made by the Board of the Boston Redevelopment Authority who could not, by themselves, legally accomplish this task in a closed session. "the selection committee was not created pursuant to any statute or by-law, but was appointed informally by the superintendent. This factor alone sets the selection committee apart from other entities considered to be "governmental bodies" under the open meeting law, almost all of which are creatures of statute, ordinance, or by-law"
A clear difference is that the BRA Task Forces (also known as Impact Advisory Groups) are not informally appointed on the whim of an elected official. They are a formal part of the Article 80 process required by the Mayor in "An Order Relative to the Provision of Mitigation by Development Projects in Boston"
It is hard to understand why the City, whose own governing regulations speak so strongly about including the public in review of development projects would seek to limit public participation and public awareness about what happens at public meetings. More than a couple people have recently asked if the Cooperation Agreement has been published. No, it hasn't. Harvard said at tonight's Task Force meeting that they have signed it but maybe it is waiting for final signatures from the BRA. Regardless, we were given the impression that it would be distributed real soon. Many neighbors have already submitted their comments to the BRA in advance of Monday's deadline. You can submit yours by email (Jay.Rourke.BRA@CityofBoston.gov) or regular mail (Jay Rourke, Boston Redevelopment Authority, 9th Floor, City Hall, Boston). The Boston Redevelopment Authority's 2nd (and final) meeting about Charlesview before the public comment period ends on March 31 will be tonight at 6:00 at the New Balance Building, 20 Guest St, Brighton. Clean Sweep - BostonHerald.com- "The result: home heists in Brighton are down this year by 77 percent so far compared to the same time last year"
Good luck trying to find on the State's website how votes were cast last week on the Governor's bill to create 3 casinos in Massachusetts. Thankfully the Globe lists the results of the roll call in today's paper. Both A/B reps voted to kill the bill by sending it to a study committee. On Thursday, the U.S. Housing and Urban Development department (HUD) announced that it will contribute $20 million to the reconstruction of the 57 year old Washington-Beech housing project at the corner of Washington and Beech Streets in Rosindale. Why are the Washington-Beech buildings shorter than the Charlesview buildings? The Washington-Beech design has 3 and 4 story townhouse buildings, that will "fit seamlessly into Roslindale’s existing fabric" according to Boston Housing Authority Executive Director Sandra Henriquez. According to the City's Assessing website, the Washington-Beech site is 7.5 acres. The 200 units planned for this site will have a density of 27 units per acre. The 4 to 10 story buildings in the Charlesview proposal will be much bigger than anything nearby in Allston and Brighton. The 10 story tower would be, by far, the tallest building not owned by Harvard. The 400 units that Charlesview proposes, on 6.9 acres, would have a density of 58 units per acre. That means the Charlesview proposal is more than twice as dense as the new Washington-Beech. There is a huge need for more housing in Boston. So shouldn't new housing in Roslindale be as tall and dense as new housing in Brighton? Today, there are 266 units at Washington-Beech complex. 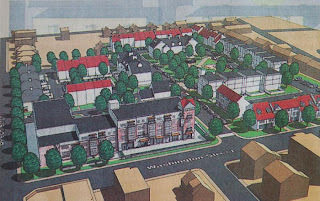 The redevelopment will create 336 affordable housing units, but only 200 of them will be at the Washington-Beech site. The other 136 units will be spread throughout the City of Boston. Going in the opposite direction, Charlesview proposes to create a larger block of low-income apartments than what currently exists at Charlesview by increasing from 213 existing units to 282 new units at the Brighton Mills site. If it is good to reduce the concentration of affordable housing in Roslindale, why is it good to increase the concentration of affordable housing in Brighton? The $101 million Washington-Beech project will be funded by $50 million from private sources, $27 million from the City of Boston, the $20 million Federal grant, and $4.5 million from the State of Massachusetts. Was Charlesview one of the 29 applicants for a HUD HOPE VI grant? According to research done by Mark Ciommo and the rest of our A/B team of elected officials, the actual acreage of the current Charlesview site is 6.5 acres, not the 4.5 acres stated in Charlesview's PNF. Mark's letter to the BRA is posted here. The site of the new Charlesview development will be acquired via a land swap that has been negotiated with Harvard University. The existing 4.5-acre site, owned by Charlesview,Inc., that houses the current Charlesview Apartments will be swapped for two sites containing, in the aggregate, approximately 6.9 acres." Harvard Athletic staff will be at a public review meeting of the Mayor's Office of Consumer Affairs and Licensing on April 9 at 11:00 in City Hall room 801. Operation of football games at Harvard Stadium and their affect on the A/B community will be discussed. The historic home at 45 Murdock St was mentioned in this blog earlier this year when its owner sought to demolish the building and obtain a zoning variance to build a 3-family home. The TAB covered the story in January with this article and this editorial. The article is particularly worth reading because of the comments left by people who experienced first-hand some of the history of the home, which was built in 1802 and is the 4th oldest home in A/B. A demolition delay established by the Boston Landmarks Commission ends on April 7. The Landmarks Commission meets on Tuesday, March 25 at 5:45 in City Hall room 900. At this meeting they will vote on whether to file a 90-day emergency landmark designation for the building. For more information call 617-635-3850. Rollins Square is another local mixed-income housing development that can help inform our expectations for what the Charlesview relocation and expansion could be. This 184 unit project in Boston's South End between Washington St and Harrison Ave was built in 2003 by the Archdiocese of Boston on 2 acres of land owned by the Boston Redevelopment Authority. The project includes 277 underground parking spaces (1.5 spaces per unit). While the density of Rollins Sq is much greater than Charlesview's proposal, the more relevant comparison is with the zoning code for each neighborhood and the surrounding buildings. Rollins Sq meets the requirements of Article 64 of Boston's Zoning Code, which sets a height limit of 70 feet and it matches nicely many of the surrounding buildings. Charlesview proposes buildings more than 40-100 feet tall, unlike anything in the area and in clear contradiction to the Allston/Brighton zoning in Article 51 that sets a 35 foot limit. One thing Charlesview and Rollins Sq have in common is that they both have the same architect from the same firm, Chris Hill from CBT. Rollins Square has a much larger amount of housing for moderate income residents than what is proposed for Charlesview. Cardinal Bernard Law, as described in The Pilot, was especially concerned about “the people who run the city” such as teachers, firefighters and public works employees. “He was concerned that they couldn’t afford to live in Boston.” We have heard the same concern in Allston and Brighton, that there is subsidized housing and market-rate housing, but not much of anything in between for people making a decent living but unable to compete with absentee landlords and others able to afford a $400,000 home. "Buyers of low-income units were required to be first-time homebuyers, with income of less than $40,800 for a single person, or $58,300 for a family of four. Moderate-income buyers were required to have annual income up to $62,350 for a single person, and $89,050 for a family of four. The prices initially set for the low-income units ranged from $141,400 for a one-bedroom to $170,000 for a three-bedroom. Moderate-income units were priced from $210,000 for a one-bedroom to $260,000 for a three-bedroom unit. Market-rate units were sold at whatever the market could bear, between $265,000 and $970,000." The Charlesview proposal creates a segregated community with low-income residents in apartments on the south side of Western Ave and wealthier homeowners on the "good" side of the Western Ave on the Telford St site. Builder Magazine describes a different approach taken in Rollins Square to provide the same high-quality homes to everyone, regardless of their income. "WHEN THE STATED GOAL IS to provide mixed-income housing, the end result often makes it clear just who lives where. Not so with Rollins Square, an unusual 184-unit community in Boston's South End, where low-income tenants enjoy the same design standards and amenities as those who paid market-rate prices for their condominiums. Boston Water and Sewer will outline street projects planned for this summer in Allston/Brighton that will impact traffic through the area. Harvard University Athletics will discuss events planned for the stadium this summer. Update from Kevin Caragee on the former Presentation school in Oak Square. While we are considering the Charlesview proposal in North Brighton, here is a look at the plans for a new housing development just a few miles away at the site of the former Maxwell Packaging factory (click for map) in Somerville. In response to KSS Realty's original proposal for 305 units of new housing, the City of Somerville asked the developer to fund a community planning process supported by independent consultants. The developer contributed $35,000 to support this process and a series of community workshops were held in the fall and winter of 2004/5. While Charlesview surrounds its 2 small parks on at least 3 sides with Charlesview buildings, the Mak Pak design consolidates its parkland into a single, larger area. The park has public streets on all four sides, making it feel much more welcoming for people from the surrounding neighborhood. Another difference is that the Max Pak project will be much better served by public transportation. It will be adjacent to the Green Line extension planned to be completed in 2011. Ward 5 Alderman Sean O’Donovan said the condos are likely to be bought by single people or couples without children, and this could be a problem for neighbors. Residents are still opposed to the Charlesview Redevelopment project and feel their concerns aren't being adequately addressed, members of the Harvard-Allston community task force said Wednesday, March 12, just two days after a public hearing on the project with the Boston Redevelopment Authority and developers. 11 Kinross Road - Create off street parking for five vehicles. Here is video from the trip organized by the Allston Brighton CDC in January to learn about the relationship between Clark University and its Worcester neighbors. People speaking are Jack Foley of Clark and the principal and teachers of the University Park Campus School. There's two sides to every story - here is video testimony from a Cambridge neighbor about living next to Harvard construction. I've posted video of the first hour of Q&A from the BRA-hosted meeting about the proposed Charlesview expansion and relocation. The lighting was terrible for video so apologies for the poor image quality. Thanks to Tim McHale who brought his own microphone & speaker system so the audio was pretty good for the people at the meeting and this video. Some of the best comments came after the battery in my camcorder died, so apologies to people whose comments weren't recorded. There is also a Harvard Crimson story (Charlesview Planners Defend Their Proposal) about the meeting. Thanks to At-Large City Councilor Steve Murphy for his letter to the BRA that calls for significant improvements to the Charlesview expansion and relocation proposal. It is great to have support at City Hall for local issues here in the neighborhood. A letter to the Editor in today's Globe signed by the Chairman of the Charlesview Board of Directors and the director of development at the Community Builders Inc takes issue with last week's story. They start by expressing a desire to discuss the neighbors concerns and I can't help but wonder why they did so much work on their proposal before starting any kind of dialogue with the community. Excluding stakeholders is no way to get the project off to a good start. But we are where we are and several of us who have made multiple attempts to start a productive discussion look forward to having one start soon. Nobody disputes the "severe need for affordable housing in Allston/Brighton". Boston, Massachusetts, and the United States all have a severe need for more affordable housing. That reality does nothing to prove that this is a great proposal. You could build 800 or 1000 units of affordable housing in A/B and still this severe need would continue to exist. There are also other "severe needs" in our community including more retail space, more parkland, and more family-friendly housing for median income earners. The developers of an expanded Charlesview should not unilaterally decide which of these local and regional needs they will try to meet in our neighborhood. The authors are also right that "some density and building height" are needed. The question is where should they be located. Large 4 and 6 story buildings across the street from detached 2 and 3 story homes will stick out like a sore thumb. a frisbee around. Open space of this sort is almost always designed to intimidate passersby and anyone suspected of not being an owner in the adjacent building." It would be a welcome change if Charlesview could include some parkland that would be both "accessible" (a legal sounding term) and "welcoming". 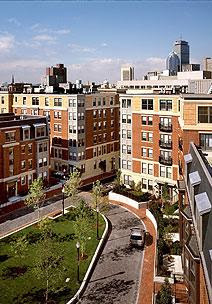 If the relocated and expanded Charlesview is to the "enduring symbol of Allston-Brighton's community spirit" that the authors of this letter describe, a great way to accomplish that would be to create spaces that integrate with the community instead of putting its little "tot lots" inside courtyards and surrounded by its private buildings. Is there "limited land available in North Allston/Brighton"? Depends on what "limited" and "available" means. Harvard owns 50 acres of unencumbered land that will not be included in its 50 year master plan. There is the multi-acre Speedway/DCR property at the west end of Western Ave rotting away waiting for someone to restore and develop it. So yes, the land is not infinite and Harvard may not consider its property to be "available", but there are certainly many locations where one could easily imagine new housing being built. It is a welcome statement that "the objective [of retail space in the proposed project] is to reinvigorate the area and provide amenity-rich services to the entire community". But the reality is that what was proposed on the ground level - a community center, convenience store, daycare, and housing - is not an "invigorating" set of uses. This project does have a lot of potential and I continue to believe both that the current proposal does not come close to fulfilling this potential and that dramatic improvements are possible. The BRA's first public meeting about this project is tomorrow (Monday) at 6:00 at the New Balance building, 20 Guest St. Hope to see you there. The Mayor's press release mentions "a new neighborhood between downtown and Allston" which would be on the 91 acres of the Beacon Yards railroad terminal that Harvard purchased in 2003 for $75 million from from the Turnpike Authority. There have been suggestions that the railroad might move sooner rather than later, and I heard last week that the Romar trucking facility may be leaving its home in Allston near the Genzyme factory as soon as this summer. At last week's Harvard Task Force meeting Kairos Shen repeatedly stressed planning for the "south side of Cambridge Street" and talked about Harvard and BU being neighbors in the future when the Beacon Yards is redeveloped. The references to "an overall plan" and "blueprint" signal a huge change in how development has been done in Allston and Brighton in recent years and further confirms the planning effort described by Kairos last week. "In Allston, on patches of land that are now crisscrossed by railroad tracks and Massachusetts Turnpike ramps, the mayor said he envisions a cluster of life-sciences developments that spur job growth and enliven the neighborhood. 'Our goal is not another industrial park like Kendall Square, but a neighborhood more like Harvard Square, a center of city life bustling with activity and commerce,' Menino said." "It looks like there's an interest on the part of the mayor to develop an overall plan and have developers come in under those guidelines," Samuel R. Tyler, president of the Municipal Research Bureau said. "That hasn't always been the case in Boston, where the city has at times dealt with each development on a case-by-case basis, rather than on how they complied with an overall plan." Mayor Menino has directed a new team, consisting of BRA Director John Palmieri, DND Director Evelyn Friedman, and the City’s Chief Planner Kairos Shen, to present an action plan for to him by Labor Day. A report issued yesterday by Attorney General Martha Coakley recommends that St. Elizabeth's Medical Center should abandon its role as a top-level academic hospital treating complex cases. Caritas Christi and officials said the report endorses the change that has already been made to change St. E's to a community teaching hospital. "In the fiscal year that ended Sept. 30, inpatient volume at St. Elizabeth's was down 6 percent compared to the previous year, the worst performance of any teaching hospital in Massachusetts. The report also said there has been an "exodus" of primary care and specialty physicians over the past few years at the hospital." In a speech today to the Boston Municipal Research Bureau, Mayor Menino will announce a vision for "neighborhood-style approach to development, not walled corporate compounds." According to the Herald, the Mayor will call "for a balancing of the need for new growth with a desire to maintain Boston’s unique character". Sounds good to me! If this is the new criteria for development, we can look forward to seeing huge improvements to the Charlesview expansion before it is approved. Neighbors want more of a mix of economic levels in the area, more homeownership opportunities, and more involvement by Harvard in the community planning process. They are concerned that the planned one- and two-bedroom units might attract people less likely to put down roots in the neighborhood, and that market-rate units might be sold to investors. Harvard’s hands-off approach to the Charlesview relocation has been the subject of strong criticism from residents. Although Harvard is funding the relocation of the complex, it has left the details of the process to Community Builders Inc. The City has made some decent safety improvements on Lincoln Street since a bicyclist was hit by a car and killed at the intersection of Franklin and Lincoln in 2004. Cobblestone rumble strips have been added, crosswalks and curb-cuts added, and the curb extended and parking eliminated between Mansfield and Royal Streets. But it seems that we still don't have a particularly safe situation based on this damage to NSTAR's fence on Lincoln St just west of Mansfield. Please join us on Tuesday, March 4 to develop an action plan to speak up about the proposal to relocate and expand the Charlesview housing. We meet at 6:30 at the Gardner School, 30 Athol St.
Based on this story in today's Globe, it seems that the Charlesview proposal has even less support than I might have thought. Tim McHale - "Harvard has moral and ethical complicity in this. I want them to come back to the table for more land. You just can't shoehorn this in and expect us to be happy." Paul Berkeley - "It's essentially much higher density, much closer to the neighborhood. The height of the buildings and density are twice as much as what zoning allows." Dave McNair - "With this project, we will have 500 low-income units just along Everett Street. There will be two separate areas, low-income and Harvard." Ray Mellone - "It's a good idea to move Charlesview. I'm just not sure this is the best way to handle it." The developer, "Community Builders, Inc", basically admits that the shortcomings of the project are a result of their failure to negotiate a better agreement with Harvard and a failure to find the financing needed to make a first-rate project. I don't know how they plan to finance the project, and I don't think all the money needs to or should come from Harvard. On their own website, the Community Builders state proudly that for their Tent City project in South Boston they "secured funding from more than fourteen sources, including tax credit equity investors and the innovative use of an Urban Development Action Grant repayment loan that guaranteed $30 million over 30 years would flow from nearby Copley Place into Tent City." From how many sources have they secured funding for Charlesview? Actually, BC has no such right. I have no right to buy some coin-operated washing machines and run a laundromat out of my basement. I have no right to buy my neighbors homes, combine the lots, demolish the existing homes, and build a 10 story apartment building. And regardless of whether or not it is a good idea, Boston College has no "right" to build dormitories, athletic stadiums, or anything else that does not pass the City's review. Like it or not, we are all governed by Boston's Zoning Code and Boston and every other town and city in America does have the right to limit and restrict development and use of property. Perhaps the folks at the Boston College Environmental Affairs Law Review might consider the issues relative to BC's planned expansion, especially considering the environmental impacts of development on the former seminary's green space. Where will the students live? This story pretty well sums of a variety of issues with City Councilor Michael Ross's proposal to limit the number of college students who can live together in a residential area to four. Overcrowding and the associated excess noise, trash, parking demands, etc. are all very real problems. Would this zoning change really do much to solve the problem? Where will these students live? There certainly is an imbalance between what a family earning the Allston/Brighton median annual household income ($40,000) can afford to spend to buy a house and what a landlord can afford to spend on the same house, especially if the landlord can get $600+/month for each bedroom. So if you can only rent to 4 students (and collect $30,000/year of rent) instead of 5 or more, that seems like it could reduce somewhat the amount that landlord will spend to buy the house in the first place. But this zoning change seems to be just a drop in the proverbial bucket. A lot of people in A/B would not or could not spend $2,000+/month on their housing (not counting insurance, real estate taxes, etc) so the absentee landlord still can afford to outspend most potential homeowners. And the overcrowding issues don't just apply when the 12 people living in a two-family home are undergraduates. College students do need to live somewhere. The number of students and amount of on-campus housing are both relatively constant (at least in the short term). If we limit the number of students that can live in each unit that will mean that more units are needed to house the students. And spreading out the off-campus undergraduate population could cause a different set of issues. I'd like to see the City doing more to deal with the effects of overcrowding, regardless of whether or not it is caused by students or others. Make sure that homes and businesses have clean and appropriate places to store trash, increase the frequency of trash pick-up, better rodent control, more resident permit parking (maybe not the exact program Boston currently has) with a reasonable limit on the number of resident stickers per housing unit, street sweeping with the needed parking bans so the sweeping can be effective, enforcement of existing parking regulations - these are just a few of the quality of life solutions the City could consider to help us live together in our densely settled neighborhood regardless of how many people of a certain age are living in a single housing unit. "Of 107 state representatives who provided their views of Patrick's casino legislation to the Globe, 40 said they are undecided; 40 others said they are opposed or leaning against the proposal; and 27 said they favor or lean in favor. Seven legislators who were contacted refused to discuss their opinions; the remaining 41 members of the 155-member chamber did not respond to repeated requests for comment." A/B Rep Kevin Honan did not respond to the survey. A/B Rep Mike Moran responded as "Undecided"